Welcome to Birds Don’t Eat Cows Suet Company! 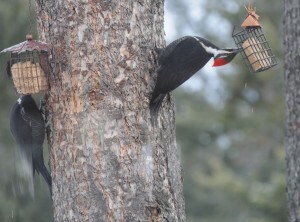 Your source for organic, vegetarian suet birds love! For years we have fed our neighborhood birds suet and seed in the winter and are delighted to have their cheery presence in the backyard and at our feeders. We enjoy having them and want to feed them the best food available, which is the reason we have created Bird’s Don’t Eat Cows. With the prevalence of feedlot agriculture and the introduction of genetically modified organisms into our food supply, the ingredients in the suet we feed our feathered friends has taken a silent turn for the worse and may very well be doing them more harm than good. Over 85% of the corn and soybeans grown in the United States is now genetically modified and these crops are in nearly all non-organic food in your local supermarket and also in most pet and bird food. Most suet on the market is made with cornmeal and rendered beef suet, both of these ingredients are very likely sources of genetically modified ingredients. organs, abnormal tumors, increased infant mortality and reduced fertility. (see links page) Rats and mice are certainly similar to birds, so if they are showing these effects how long will it be before the same effects are showing up in our much more sensitive bird populations? Another big problem that is threatening our birds is the conversion of millions of acres of what was once family farms to corporate monocultural crops that are all pesticide ready. These crops are sprayed every season with Round-Up herbicide which kills everything but the genetically modified plant. This means any other plants that our bird/insect populations use as food or cover are being eliminated and their available usable habitat drops significantly. One example of this is our plummeting Monarch population, they are dependent on milkweed which has become harder and harder to find as more and more fields are chemically treated to kill the so called weeds. The 150+ million pounds of pesticides used each year are directly toxic to our bird populations as well as amphibians, fish, insects and you. 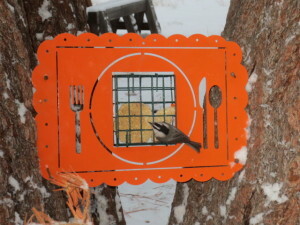 Our new suet feeder!! Thanks Kimberli Matin! See more of her wonderful feeders here! There is no data on how genetically modified organisms will effect the Red-breasted Nuthatch at your feeder: Are we rendering it sterile? Damaging its internal health? or dooming its offspring to failure? Can we afford to learn this the hard way and continue to feed our birds untested, chemically altered food? For the good of our birds we need to start changing our feeding habits now and begin speaking out against genetically modified agriculture at every opportunity. Buying organic food for ourselves, our pets and our birds, is the safest, smartest way to go! Read more about our story and see our great products.